Olivia, Eel, Tom, Georgia and Aeysha sat with Abbie in a steamy café, eating iced buns. An old TV on the counter was tuned to a rolling news channel. Very soon they would have to set off for the Palladium, where the final of the Children’s Royal Spectacular was being televised, to meet up with the rest of the cast who were going there straight from school. They had been to the costumiers to see the dress that Abbie was going to wear to play Liesl in The Sound of Music. It was a treat decreed by Miss Swan, who had said that as Olivia and Tom had been working nonstop over the last thirty-six hours, they deserved a break. ..
“Could I?” said Georgia, looking both chuffed and worried at the same time. observations: Aficionados of the stage school book will recognize all the key elements here, updated to modern times. Lyn Gardner ‘s character are attending theatre school and know all about costumes, auditions and, as it turns out, circus skills. There is also a more modern thread about bullying – very well done, showing why people follow a Queen Bee, and how difficult it is to resist a mean girl. This is the start of what looks like being a long series…. presumably there are still plenty of children who love to read about stage school, and, as in days of yore, there is no need to have the slightest shred of talent or desire to perform oneself. Links up with: the entire oeuvre of Noel Streatfeild, click on the label below for previous entries. The picture is artistic licence: as Lyn Gardner doesn’t describe the dress, we felt at liberty to find something we (with an excessively long history with stage school books) felt appropriate. 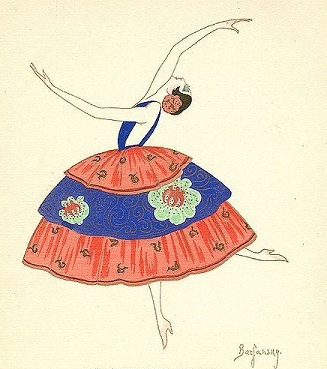 It is from a fashion magazine of 1920, and shows a ballerina called Paulette Duval in a costume designed by Georges Doeuillet. Oh wow, how wonderful that you have featured this book. Lyn is a great friend of mine and next time I see her (she is on Edinburgh duty right now) I shall tell her about your post! She is really enjoying writing this series. Oh great, please do tell her. I love the idea of continuing the tradition of stage school stories.